Although the inventor of modern running shoes, Nike doesn’t have a reputation among distance runners these days. Said athletes usually wear one of five brands: Asics (which Nike first sold as a distributor in the ’60s), Mizuno, Brooks, Saucony or New Balance. You just can’t “do it” in Nikes anymore, at least without looking like a corporate shill. Putting the brand aside for a minute, it’s obvious Nike’s top of the line running shoes are just as competent as others, even if they’re not sold in running boutiques. Vibram is the only manufacturer that may end up having a technological advantage. Until then, the rest are all designed with big R&D budgets, and they’re well-cushioned, stable, and light. The same is definitely true of the recently released Lunar Glides by Nike. Despite its peculiar, almost off-putting looks, the shoe is radically functional. As part of Nike’s Free (aka barefoot) line of running shoes, the Lunar Glides are rated as a “10,” it being the most like a traditional shoe (“0” being completely barefoot). They feel nothing like running in Five Fingers (although they look better), but deep grooves in both the out- and mid-soles make the Glides feel more flexible, while providing excellent grip at the same time. Additionally, the “Free 10” label is more than marketing parlance, as the shoes are super light—right on par with Asics. At the same time, they are comfortable and stable, thanks to thick mid soles with raised sides to discourage pronation. The lightness comes at the expense of durability though. Unlike most Asics, which use fish net-like fabric to protect the uppersole, the Lunar Glides sheath your feet in soft cotton-like fabric. They breathe like a dream, but they tear easily. After falling last month, I ripped a hole in the fabric near my big toe. My sock isn’t showing (yet), so hopefully the inner layer of fabric won’t follow suit. Perhaps the biggest advantage of the Glides, however, is that they come with Nike+ baked in. Insert the pebble like monitor in a fitted hole underneath the insole, and you’re good—no exterior lace jacket required. Granted, a sensor holder works just as well, but they do run $10 extra. (The Glides retail for $80-100 depending on the store.) Although deserving of its own review, I’m sold on Nike+, as it encourages a faster pace better than a stop watch. Plus, it keeps track of all my stats, so I can compare past performance with present. Back to the elephant in the room—are you capable of wearing the Swoosh and everything it stands for (blase status, a sweatshop past, corporate-ness) as a runner? You decide. Just know that Nike still makes great footwear. And Lunar Glides are equally as comfortable as $150 running shoes made by sexier brands. Review based on retail pair of Lunar Glides provided by Nike. Blake, this post is so timely! I had a conversation about running shoes with a friend just this weekend . . . We were talking about which shoes I should get. What do YOU suggest for long feet and wide insteps? Hi Sara. I’m not really qualified to answer that question since I’m no shoe salesman. :) My advice would be to go to a running boutique and ask someone there. let me know what you get. Thank you for the link to Starling Fitness. I still use my Nike+ sensor holders on my sandals when I go hiking in the summer. I’ve even cut holes in the insoles of my regular shoes so I could slip in my Nike+ sensor. It’s not as hard as it sounds as long as you have a sharp X-acto knife and patience. Thanks for the review of the LunarGlide+. I didn’t know they came in black as well as white. Cool. 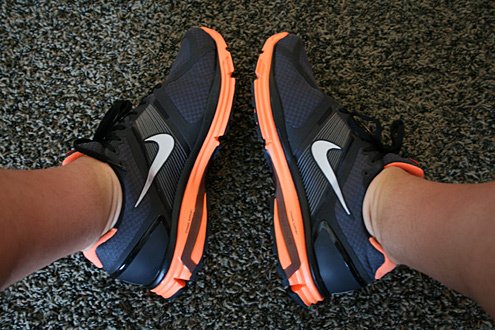 I love my Nike Lunar Glides. I’m a dedicated runner who averages about 30km a week. I was first introduced to these shoes at a Nike world run in the fall and they were encouraging participants to run the race in the Lunar Glides. Well, I thought I’d give it a try and it was like running the race on air! I suffer from a slight case of Plantar’s Facsitis in my right foot, and bunion pain in both feet. After running in these shoes, it was as if I’d had a massage. The shoes were soft and cushy but provided a lot of support in all the right places. The fact that there is no stitching is also a great feature for someone with bunion issues. For years I’ve been faithful to the Asics 2100 series, and recently tried a pair of New Balance, but, nothing compares to the comfort of the Nikes. I plan to convert my entire running shoes over.